Butcher Box is one of our sponsors and has provided us with a great deal. Our fans can get this great offer by using our Butcher Box Coupon. When you use one of our promo codes you are directly supporting our podcast and site. Thanks for your support. Butcher Box delivers grass-fed meats to your front door every month. They have a few different options for the boxes that they ship out to you. The Mixed Box contains 8.5-11 pounds of 100% grass fed and grass finished beef, organic chicken and heritage breed pork. This box is the most popular one they have to offer and our favorite box. The grass fed and organic meat is delicious. The All Beef Box contains 8-10 pounds of 100% grass fed and grass finished beef. The Chicken and Pork Box contains 8.5-11 pounds of free range organic chicken and heritage breed pork. The Beef and Pork Box contains 8.5-11 pounds of 100% grass fed and grass finished beef and heritage breed pork. You can also select the option to double up and Butcher Box will give you a discount for ordering more than the single box. The Beef and Chicken Box contains 8.5-11 pounds of 100% grass fed and grass finished beef and free range organic chicken. Where Do I enter the Butcher Box Promo Code? You’ll select the box that you want first. Then you will be at the shipping and billing page. 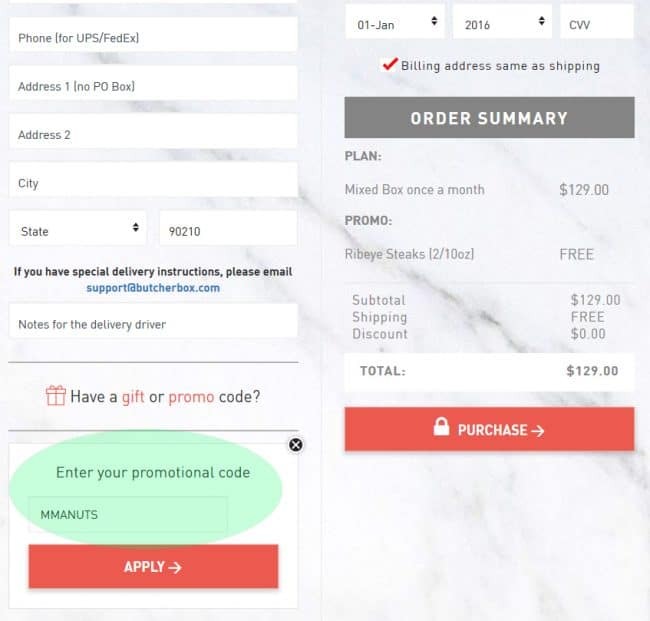 Towards the bottom, left hand side of the page, there will be a section that says “Have a gift or promo code?” Click on the box and enter our Butcher Box Promo Code for $10 off plus 2 Free Ribeye Steaks.